Lindsey Leavitt is a former elementary school teacher and present-day writer/mom to three (mostly) adorable little girls. She is married to her high-school lab partner and lives in Las Vegas, Nevada. She is the author of the PRINCESS FOR HIRE series and SEAN GRISWOLD’S HEAD. She also feels weird writing about herself in third person. Please welcome Lindsey Leavitt to Alison Can Read! I'm so grateful that Lindsey asked me to be on her blog tour. I'm a huge fan of her books and so grateful to be able to help her promote the last Princess for Hire book. Thanks Lindsey!!! 1. For those who haven't read the Princess for Hire series, can you give a brief overview of the books and of Desi? Princess for Hire is about Desi, your every-day too-tall, feels-small girl who gets a job as a magical substitute for vacationing princesses. The longer she works for the Façade agency, the more she learns that being a princess isn’t all it’s cracked up to be. 2. The Princess for Hire books are essentially middle grade magical realism. Your other book Sean Griswold's Head is YA contemporary fiction. Was it a lot different to write a contemporary novel? Do you have a preference for one genre over another? 3. If you could spend a week in any city in any country, where would it be? What would you do? Oh my. This is hard. Right now I’m thinking Bora Bora, but that’s just because I hurt my back wakeboarding last week and all I can imagine is massages in private bungalows. When I’m in top health, my answer would probably be London and I’d like to go do anything touched by royalty. I’ve spent the last five years researching various monarchies, and it’d be fun to see the most popular monarchy in the world in action. 4. What are some of your favorite MG and YA books - either recent releases or ones from when you were younger? Some older midgrade that comes to mind are Ella Enchanted, The Giver, & The Witch of Blackbird Pond. Some recent ones I liked were Kat Incorrigible by Stephanie Burgis (Jane Austen with magic) and The Classroom by Robin Mellon, which comes out this month and is the funniest mid grade I have read in years. 5. Can you please offer some writing advice aside from the ubiquitous "read a lot" and "write a lot?" Oh, more? Okay, the most important thing to remember with a rough draft is for it to be considered a draft, you need to finish. It doesn’t matter if it’s good, it really doesn’t, but you should try for a beginning, middle and end. Just get that skeleton down on paper, then in revision you can explore its closet. I would love to hang out in a bungalow at Bora Bora! I've been wanting to The Sky is Everywhere by Jandy Nelson for awhile. I haven't heard of this series but it sounds cute. I would love to be hired to stand in for a princess! Dream job! LOL Great interview! Sean Griswold's Head looks like a fun read - I'll need to check out one of Leavitt's books sometime! Awesome interview! I ahve not read anything by this author but I will check her out. Definitely write and read A LOT! And I would suggest adding SEAN GRISWOLD'S HEAD to the list--that's definitely one of my fave books. Great interview! The Witch of Blackbird Pond was one of my favorites. The title has such a nice ring to it. Oh, I had no idea the same author wrote both the Princess For Hire series and Sean Griswold's Head. But I always hear such great things from the both of them that I'd like to try one of them out. Its funny you had this today, my daughter is making me reread Princess for Hire AGAIN! We have a signed to her copy and shes just tickled pink that it says Princess Phaedra in it. And we just adore Lindsey! We can't wait to read this latest installment. Awesome interview! And I think the advice to finish the rough draft is good cause even if your practicing its important to get each piece done. Its too easy to just give up but what do you learn from that? I absolutely love London. It's so much easier to navigate through than I thought it would be, but yes, I can't wait to visit again. Fun interview. It's always a treat to hear about how authors approach writing, and writing in other genres. Great interview, Lindsay sounds really nice. :) London is really great, I was just there about a week ago. 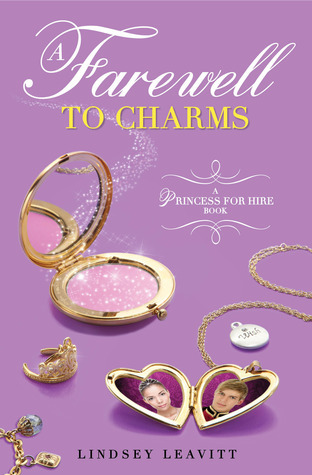 I can't wait to read a Farewell to Charms, although it's kind of sad to see the series ending!